In anticipation of its board meeting on March 8, 2018, Metrolinx has released a report updating its analyses of various proposed new GO stations, some of which are intended to serve John Tory’s SmartTrack scheme. The whole question of new stations has been under a cloud recently thanks to reporting by the Star’s Ben Spurr who has documented political interference in the evaluation process. Metrolinx is very sensitive to this and tries to dodge questions both by characterizing such reporting as “conspiracy theories” and by saying that they want to go forward rather then looking back on how we reached the current situation. It’s water under the bridge, dirt swept under the carpet, pay-no-attention-to-that-man-behind-the-curtain territory. And if you don’t buy that, well, politicians make decisions all the time, and the staff’s job is only to provide advice. That the advice might be tailored to fit a desired conclusion is simply beyond discussion. In a set of analyses conducted in mid-2016, Metrolinx reviewed several stations and found some of them wanting in the contribution they might make to the network. Notable among these was Kirby Station on the Barrie line which was not originally recommended. Magically, the numbers changed after Ministerial intervention. We have no way of knowing how many other Metrolinx staff recommendations have been perverted in this manner, but the problem will not go away. Already the newly minted Minister is musing about stations in her political territory, the Milton corridor. The new report seeks to justify continued spending on many stations, but with the focus on individual station analyses, important details are buried or simply not included in the published information. We are supposed to read the summary and look no further. The status of stations still actively under review is presented in one chart. In a marvellous piece of newspeak, Metrolinx refers to stations where “Benefits are Positive but Less Than Costs”. In other words, the costs outweigh the benefits, but this is presented as if it were a positive state of affairs. One would generally expect that the presence of new stations would be positive, and the only case where this does not apply depends on the presumed effect of adding a stop on the attractiveness of service to existing and potential riders. A large proportion of the “benefit” in Metrolinx analyses arises from the imputed value of reduced travel times and diversion of trips from auto to transit. The model is very sensitive to changes in travel time, and so the addition of stops tends to hurt ridership whose trips are lengthened by adding stations. This information is echoed on the “How Will You Benefit” pages such as the Stouffville Corridor page where it is quite clear the intent is for all trains to stop at all stations. The first two options, notably the one including express service, were dropped because of the infrastructure needed to provide for SmartTrack and GO/RER co-existence. Option D makes the cut because with fewer new stations, it creates less delay for riders on the outer ends of the corridors and hence less imputed value from lost time and potential lost ridership. Times have changed at Metrolinx, and they now regard a mix of express and local services as best service design. CEO Phil Verster was quite adamant on this point during a media briefing and was quite dismissive of the idea of stopping trains for comparatively few passengers. There is only one small problem – it is precisely this type of stopping pattern and service level at every stop that was used to “sell” SmartTrack as part of GO/RER. No amount of managerial swagger can undo the very real position taken by Metrolinx and by municipal supporters of SmartTrack less than two years ago. A train every 20 minutes is not what riders in Scarborough and elsewhere along the ST corridor expected in place of their existing transit service, especially when SmartTrack is touted as a substitute for stations on the Scarborough Subway Extension. Stops that would be affected by the new service design include: Bloor-Lansdowne, Kirby, Park Lawn, Mimico, Finch-Kennedy, Lawrence-Kennedy, Gerrard-Carlaw, St. Clair-Old Weston. This list may not include all affected locations as only those in or directly related to the new station analysis are mentioned in the report. 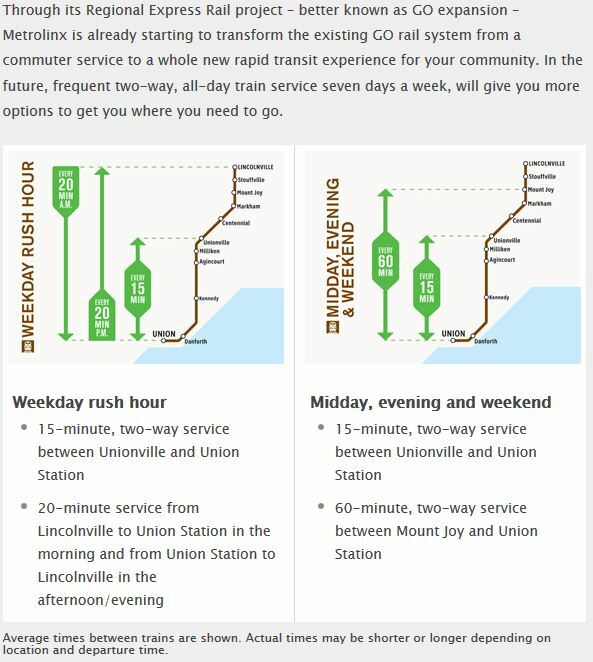 By reversing course and reinstating express trains in the service plan, Metrolinx avoids the travel time penalty of adding new stations, but with the offsetting effect that these stations get much less service. The problem is so acute for the SmartTrack corridor that Metrolinx is now trying to figure out how to squeeze more trains onto the line, and even talks of a separate “relief” function for a U-shaped Unionville to Bramalea service. 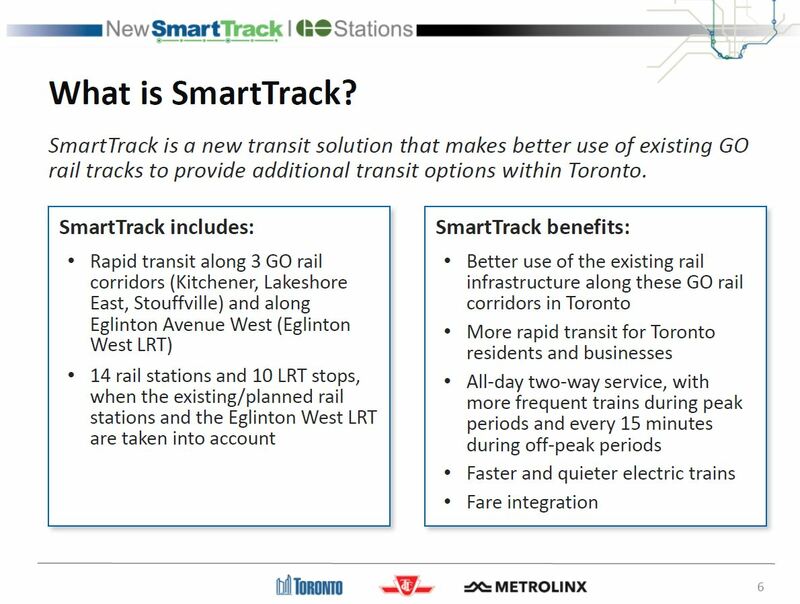 The infrastructure to support this does not exist, and the scheme is a far cry from the idea that “SmartTrack” could simply be implemented using existing infrastructure. A further problem lies in the Union Station Rail Corridor (USRC) where track, signalling and platform configurations combine to dictate how many trains/hour can operate there without substantial upgrades. In a media scrum at the Board of Trade, CEO Verster stressed that service was the most important factor, the one with the biggest effect on ridership. GO Transit and Metrolinx have planned within the limitations of their corridors including the USRC, but there may now be a recognition that what is planned simply is inadequate to address region-wide needs. By the same logic of minimizing the time of every stop at every station, implementing level boarding (as opposed to low platforms and a delay from stepping up/down and positioning the train) reduces the negative impact of the station on the economic benefits of the upstream riders. The business cases now assume that all fare barriers have been removed with an integrated fare system in place. The economic benefits of fare integration is estimated to exceed the cost by a factor of 12 (ie a BCR or Benefit Cost Ratio of 12). There is no question that level boarding will speed things up at GO stations, but this is a matter of reducing the time spent at all stations, including any added ones. Not mentioned at all were the travel time savings possible with electrification. In earlier studies, these were counted as an offset to the extra delay of added stations. Elimination of physical barriers or congestion points at platform access will only speed travel for riders who show up at the last minute and could face a missed trip if their path from parking space or connecting bus were longer than a “crow fly” distance, or delayed by queueing at fare machines. Otherwise, fare validation occurs during the wait time before a train arrives. From a demand modelling perspective, there is also a “barrier” inherent in extra fares for each stage of a journey. Metrolinx has long talked of the need for “regional fare integration” without getting into the specifics especially as they might affect riders of local transit systems. If the analysis mentioned above shows a benefit cost ratio of 12, or extremely high, this must be based on some specific mix of tariff and subsidy changes. A major failing of the New Stations report is the omission of much detail such as the derivation of claimed demand at the various stations, notably a split of new and existing riders, a breakdown of boarding and alighting passengers, the effect on conditions at nearby stations, and the specifics of the modelled service plan. Some of this information was included in the initial round of evaluations in 2016, but only summary values are published in 2018. Some stations are primarily “boarding” locations either from local transit or from parking. Indeed, it might be argued that in a few cases, the primary function of a new station is to host a new parking garage that might not fit at an existing site. Some stations are primarily “alighting” locations in that they are destinations, not origins, of trips. This is strikingly true for the Liberty Village and East Harbour stations who primary function is to bring people to work in the immediate vicinity, not as an origin point for “in town” travel. Demand at stations could be new GO riders, or it could be from trips that are more conveniently served from the new station. For example, a new station might shorten the access trip to GO by car or transit, and this translates to an imputed benefit from time saving. For the SmartTrack stations, the 60-year benefits are shown as outweighing the capital costs by a factor of almost 4:1. However, almost all of those benefits are the notional value of time saving, and to a lesser extent, reduced auto travel. Operating costs, including that of any additional local transit service or of fare integration subsidies is not included in the analysis. Of the six SmartTrack stations, East Harbour, the site of a proposed massive commercial development east of the Don River, is by far the major contributor to the positive comparison for SmartTrack. It accounts for 84% of the travel time savings and 55% of the passenger activity at the six stations. The analysis did not include the presence of the Relief Line, and the service plan assumes that Lake Shore East trains do not stop at East Harbour. Because the individual station cost estimates are not broken out, it is impossible to know the performance of the StartTrack stations, but we know from the summary that only East Harbour and Liberty Village have benefits which outweigh their costs. This is an almost meaningless analysis. Metrolinx claims that it will produce an updated analysis and recommendations by the end of 2018 in time for an RFP for the implementation and operation of GO RER and SmartTrack. At this point, a huge amount of detail is missing, especially the degree to which the original GO service plan from 2016, on which a great deal of infrastructure work now in progress is based, must now be revised. It is quite clear that Metrolinx is struggling to come up with credible plans, and they are quite defensive about the changes they are now making. All is not sweetness and light, and the unseen hand of political interference to justify many of these stations is clearly at work. In a future article, I will turn to the individual stations and discuss the issues affecting them.